“What must it be to be someone else?” Gerard Manley Hopkins wondered. It is a question that has occupied Colm Tóibín before, whether the someone else was Henry James, or the mother of Christ. What must it be to be someone else in a book that is not a novel, and in which the someone else is a poet who specialized in solitariness, who could be “chilly” in person, and who did not hesitate to turn away uninvited guests. When Mary McCarthy threatened to visit Elizabeth Bishop, she replied: “I’d be grateful if you didn’t come over”. Tóibín’s On Elizabeth Bishop introduces the poet in new company – he likens her to James Joyce, and more persuasively to Thom Gunn – and alongside old acquaintances (Robert Lowell, Marianne Moore). Mostly, Tóibín recognizes in Bishop aspects of himself. Both writers are drawn to grey, muted coastlines; both invest feeling in “things withheld”. 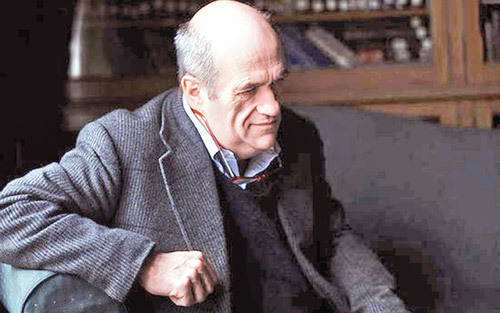 Like Bishop, Tóibín found himself returned to childhood by the experience of “elsewhere”: Bishop’s fifteen-year sojourn in Brazil prompted her to recall and reimagine Nova Scotia; having “escaped Ireland” to write his first novel in Southern Europe, Tóibín found his proper “melancholy tone” in memories of Wexford. These childhood haunts were, for both writers, places of profound loss. Tóibín is particularly good on estrangement, and puts his finger right on it when he says that Bishop’s life in Brazil – at least as retold in her letters and poems – seemed “a parody of ‘normal life’”, “a comedy she had invented”. Yet he tends to underestimate Bishop’s knowingness about this kind of self-estrangement: he is deaf, oddly, to the ironizing distance she puts between herself and the naive tourist speaker in “Arrival at Santos”, who “somehow never thought of there being a flag” and who hopes that “the customs officials will speak English”. When he went away to school aged fifteen, Tóibín wasn’t allowed to take his poetry books with him, so he spent the month before he left home copying poems into a notebook. It is a good way of becoming intimate with verse, and a habit that persists in this volume. Sometimes he will drop a phrase of Bishop’s in passing, and ask you to pick it up (“the attempt to escape this cold spring had been a sojourn . . .”; “because of the sheer sweet intensity in how nature greeted my eyes . . .”); or he will find another way of copying her style into his prose. Bishop’s verbal tic of self-correction, for example (“shadows, or are they shallows?”), comes out in Tóibín’s prose remix as “she was careful, or as careful as she could be, not to allow that to happen in her life, or more accurately, in her poems”. Tóibín is a less inviting mediator of the poetry when he gets up close and technical. Paragraphs which begin, “The next stanza reads . . . ” and which proceed by counting syllables and marking stress patterns seem thoroughly competent, but not a particular enticement to follow him into the verse. Things open up in the chapters on Gunn. The heart of the story here is not Bishop’s meeting Gunn in 1968, but Tóibín’s recollection, while reading one poet, of something he’d heard in the other. Gunn said of his mother’s suicide (he and his brother had found her body), “obviously this was quite a traumatic experience”. Bishop had written something equally deadpan, about her mother’s confinement to a mental institution (“well – there we are”). So the two poets meet in Tóibín’s reading of them, and in that meeting he discovers something about himself: that the writers he had read intensively in his teens – Gunn, Bishop, Thomas Mann and James Baldwin – had “hit [him] emotionally”, not only, as he had thought, because of their common sexuality, but also because each had suffered the early loss of a parent (in Baldwin’s case, the turbulent relationship with a stepfather). “In the work of both Bishop and Gunn, words meant simply what they said”, Tóibín claims, and he returns to that thought several times in this book, as though to appoint himself guardian of the poetry’s guardedness. “It is important to insist that the poem ‘Roosters’ is about roosters”, he says, and goes on: “if Bishop had wanted to write a poem about maleness and militarism, she would, or might, have done so, although it would have been unlikely”. Aside from the fact that Bishop wrote to Marianne Moore, in a letter Tóibín later quotes, that she wanted the controversial “water-closet” in “Roosters” to “emphasize the essential baseness of militarism”, one could respond that if she had wanted words to mean only what they said, then she probably shouldn’t have put them into verse, and so encouraged them, as poems often do, to mean other things too. Bishop might well have kept her private life private (she believed in “closets, closets, and more closets”), but it is harder to imagine that a lesbian relationship would have come as a shock to Moore, who was raised in a lesbian household in which it was heterosexual unions – especially marriages – that were mistrusted, or treated with scorn. The closing chapters of On Elizabeth Bishop, on Bishop’s friendships with Robert Lowell and with Moore, seem a little perfunctory. They’re put together largely from the poets’ published letters and from stories told by previous critics: Tóibín acknowledges his large debt to David Kalstone, on Bishop’s spat with Lowell over his use of lines from private letters in his poems, and to Kirstin Hotelling Zona on Bishop’s correspondence with May Swenson. Tóibín’s book starts out sounding a bit like a novel: “She began with the idea that little is known and that much is puzzling”. It ends with some lines of Bishop’s on the same theme – “the little that we get for free / the little of our earthly trust. Not much” – to which Tóibín responds, “not much perhaps, but enough to be going on with. Or perhaps not”. Borrowing the poet’s trick of lending weight to an utterance by seeming to unsay it, and so having it both ways, Tóibín finds a neat way of wrapping things up. This pocket-sized volume with its generous margins, its thick pages, rough-edged as though you had cut them yourself, tells us quite a bit about a novelist whose biggest disappointment, he has said, is that he would like to have been a poet; as to what it tells us about Elizabeth Bishop that we couldn’t have gathered elsewhere – perhaps not so much.